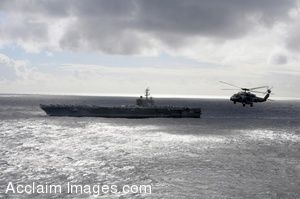 Description: Clip art photograph of An HH-60H Sea Hawk assigned to the "Black Knights" of Helicopter Anti-Submarine Squadron (HS) 4 flies past the Nimitz-class aircraft carrier USS Ronald Reagan (CVN 76) preparing for an air power demonstration for more than 1,200 friends and family members aboard. Ronald Reagan is conducting a Tiger Cruise, which allows Sailors to bring aboard friends and family to experience life aboard the ship. Ronald Reagan is on a scheduled deployment operating in the U.S. 3rd Fleet area of responsibility. (U.S. Navy photo by Mass Communication Specialist 2nd Class Joseph M. Buliavac). Clipart photograph by Department of Defense Public Domain.